By the middle of the 20th century there was a good understanding of how the physical properties of gases and solids could be related to the forces between their constituent molecules, but a theory of the liquid state was lacking. John Barker worked on all three phases of matter and on the intermolecular forces themselves, but he will be remembered particularly for the crucial role he played in creating a quantitative theory of liquids. John Barker was born on 24 March 1925 at Corrigin, a small town in the wheat belt of Western Australia. His father, Thomas Louis Barker (1900-1978), was a general practitioner who had been born in Fiji and his mother, Dorothy Erica, nÃ©e Janes (1906-1949), was from Melbourne. The family moved several times in John’s early years, first to Melbourne, then to a small town in the Mallee in Victoria, before settling at Red Cliffs in the Mildura irrigation district in north-west Victoria. Here he completed his primary education at Red Cliffs State School and then went, in 1936, to Mildura High School. He did not do well there and in 1938 was sent as a boarder to Ivanhoe Grammar School, Melbourne, to which he won a scholarship. It was here he first showed his true abilities. A master, Clement Jepson, introduced him to the delights of mathematics through Silvanus Thompson’s Calculus Made Easy, and he acquired also a deep appreciation of English language and poetry. He was top of his form each year, Captain of School in his final year, and left in 1942 with a Commonwealth Scholarship to the University of Melbourne. Money was tight ‘ his father was a better doctor than he was manager ‘ but he sent John to Trinity College, the Anglican residential college of the University of Melbourne. John had originally intended to study chemistry, a subject that had fascinated him since he had read about the chemistry of photography in the studio of his maternal grandfather, but Jepson’s teaching at school and his own abilities led him first to physics, in which he qualified for a BSc in 1944, and then to a second-class honours degree in mathematics in 1945. In this course he was greatly influenced by the lectures of HC Corben who was later to write a much-used text book on classical mechanics. He joined the Division of Aeronautics of CSIR in 1948, resigned in 1949 following the death, by suicide, of his mother, and rejoined the CSIR Division of Industrial Chemistry in 1950. His career at CSIRO was outstanding and by 1967 he had been promoted to a level where a move into management was the next natural step. This he resisted; he felt he had no abilities for that kind of work and that his talents would be wasted there. He thus resigned from CSIRO in 1967 to take up a professorship at the Physics Department at the University of Waterloo, Ontario, Canada and in 1969 moved to the IBM Research Laboratory in San Jose, California. A full account of the life and achievements of John Barker can be found in the source details below. 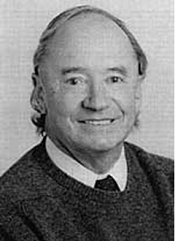 Rowlinson JS, 1996, John Adair Barker 1925-1995, Historical Records of Australian Science, 11 (2): 179-190. [Australian Academy of Science – https://www.science.org.au/fellowship/fellows/biographical-memoirs/john-adair-barker-1925-1995].